Goncharova's contribution to musical modernism was decisive in four different areas. Firstly, as a painter, by her creation of the folkloric concept as a means of opening up historical references and an access point through which to reach music. The dancing peasants from the 1911 polyptych "Vendange" recall the maenads depicted in many popular scenes of bacchanalia after harvesting. The luminous tones, derived from the Russian iconological tradition and the bright colours of the Russian "lubok", heighten the musicality of the subject. Secondly, as a quiet beginner of Rayonism, and inventor of one of its most idiosyncratic inventions, the inner being of music - rhythm and light. This particular form of abstraction brought her later to Cubism and Futurism. This is a difficult concept, which gained impetus from Larionov's description of a Rayonist painting, but few of Goncharova's Rayonist works such as "A Rayonist Construction" (1913) and "Dame au Chapeau" (from the early period, oil on canvas, 1913) can be called abstract in the way that Larionov's merit the term. Goncharova saw in music an otherworldly ideal of spiritual purity, as yet unattained by painting. The German theoretician of the "music+painting" analogy Wilhelm Housenstein built a simple equation upon this dilemma: "Music comes to the aid of painting, drawing assists music. Painting and music become parts of an eschatology; unconcerned by possibility, they seek finality". In the world of Rayonism, Goncharova had acquired early the ability, using a few basic elements, to construct a composition on the basis of its own intrinsic rules. 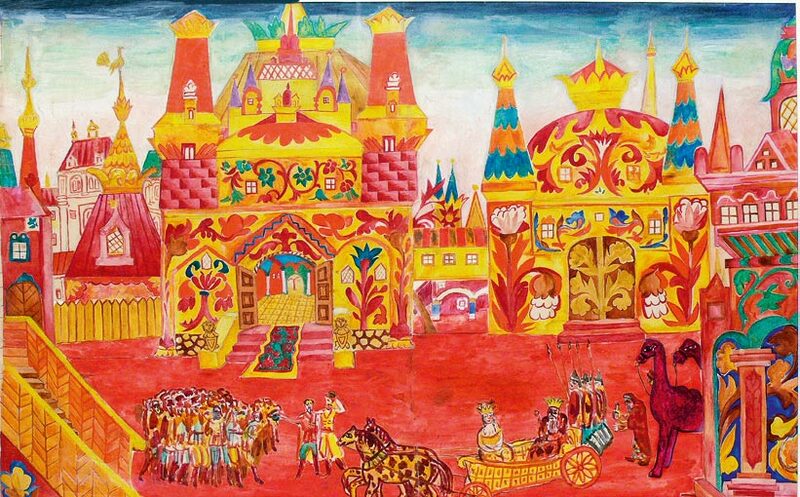 The foundation for Goncharova's theatrical work was probably laid down in this early period - the translation of motifs taken from nature, popular culture and historical fragments into new, rhythmical, vertical structures and col-ouristic values - is based on the principle of rhythm, a vision of the artist unaware of another vast world knowledge. 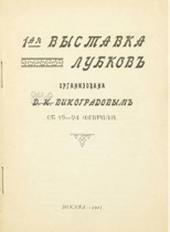 It was through Goncharova's contribution for Wassily Kandinsky and Franz Marc's "Der Blaue Reiter" almanac that she learnt about Kandinsky's philosophical essay "On the Spiritual in Art" (Uber das Geistige in der kunst, 1911), in which he put forward a theory of sound based on colours and forms freed from pure representationalism. The origins and inspirations for that famed design of forms and music approach, a sure signal of the new aesthetics' glistening newness, preoccupied vast numbers of Russian artists of that time. Responding to this wealth of knowledge and the pressure of historical precedents, Goncharova's design did something new. She mapped intersections, divergence and enmeshed ideas across centuries and disciplines in order to provide an alternative vision of artistic development within musical development and thought. Thirdly, she was Sergei Diaghilev's foremost illustrator, creator of a new kind of stage, in which the design concept took over the whole presentation of communication, with simultaneous access to all the acts, so that the stage itself became a kind of Gesamtkunstwerk object. Searching for a common source for the arts, Goncharova dreamt of a vaguely defined poetical quality that could be achieved in painting and theatre design by eliminating the imitative principle and replacing it with the meticulously verified use of colours and forms. She was never able to free herself completely from purely naturalistic reproductions, even while seeing new, non-representational techniques of depiction. Her design story was begun with the idea of incorporating musical elements into painting. This never become widespread in modernist Russia, but five decades later was often used in abstract painting. 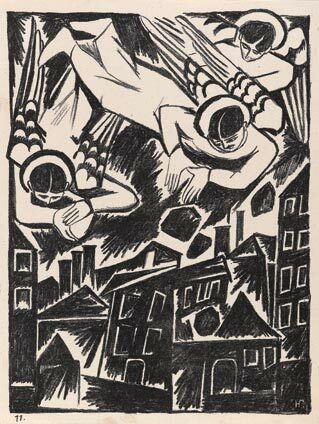 Clearly, Goncharova listened to music with ears attuned to her own pictorial needs. It is not surprising that she was drawn to the music of Nikolai Rimsky-Korsakov, and so respected the composer's ideological affiliation to the "Great Five" group, known for its propaganda of a Russian National culture. The production was, indeed, a new climax in neo-nationalism: woodcuts, icons and folk ornament dominated the stage. This occurred despite considerable technical knowledge about music by artists. Painters like Alexandre Benois and Leon Bakst, who were closest to Diaghilev and upheld a belief in music as abstract, could find it embodied in the work of Igor Stravinsky, Sergei Prokofiev, Reynaldo Hahn (18741947) or Lord Berners (1883-1950). 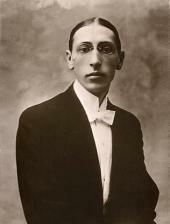 According to a Flemish musicologist Francis Maes, "the influence of Diaghilev and Benois was crucial here, persuading Stravinsky to turn his back on the remnants of the kuchka aesthetics. The experience that ultimately convinced him to reject opera as a modern art form was the 1914 Parisian production of Rimsky-Korsakov's 'The Golden Cockerel', staged by Diaghilev in ballet form." 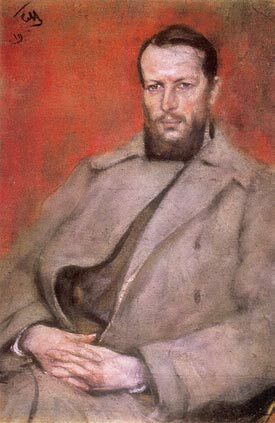 Benois's taste encompassed the very divergent styles of Schumann, Brahms, Berlioz and Wagner, while Bakst admired Mozart, Chopin and Rossini (and detested Berlioz). Diaghilev himself surprisingly preferred the precision of Stravinsky, who remained his favourite composer for 19 years, but found less and less subject matter to use Stravinsky's music. Artists with more consistent tastes like Valentin Serov and Alexander Golovin, who admired Tchaikovsky, Borodin, Alexandr Tcherepnin (1899-1977) and the Spaniards like Manuel de Falla (1876-1946), were the exception. Musicians, however, displayed little interest in or knowledge of the visual arts: Stravinsky, Prokofiev, Mikhail Ippolitov-Ivanov, Alexander Mosolov and Lourier were unusual in their close contact with painters. The era of Stasov's subjectivity and fanaticism was over. Russian art at the turn of the 20th century was indebted to musical ideals, as evidenced in works by Mikhail Nesterov, Mikhail Vrubel, Konstantin Korovin, Nikolai Sapunov and others, and remained solidly three-dimensional and illusionistic. Most painters, however, admired music because it exemplified to them an art that was independent (of other art forms and the material world), self-referential and comprised of indivisible form and content. The desire to make painting more like music thus motivated painters, paradoxically, to discover and use what was unique about their own medium. For this reason, the term"musical" became frequently synonymous with "painterly" and the opposite of "literary". Painters sought to convey meaning through colour and form, space and light; they used images symbolically to evoke mood, essence, and subjective states, in pointed contrast to the storytelling of narrative art. Technical examinations of each of Goncharova's designs illuminate the core of her musical motivations and intuitions. The assessment of her designs for"Les Noces" (The Wedding) has undergone major and minor changes in the course of the past century or so. Here it is plausible to suggest that she followed Gauguin's ideas about the correspondence between harmonies of colour and sounds when she tested Stravinsky's passages of flute and bells with blue, violet and red. These collaborations reflected a musical literacy on the part of painters, which was typical of 19th-century middle class society. Relatively few musicians could draw or had been raised in an artistic milieu (outside Russia, Mendelssohn and Debussy were exceptions), while most painters possessed at least a rudimentary musical education. These included, among others, Kandinsky, a talented musician who kept a piano in his studio and corresponded with Arnold Schoenberg; Paul Klee, who played the violin with his wife, Lily Stumpf, whose piano teaching, in addition to Klee's artistic and musical activities, sustained Klee during their financially difficult beginnings in Munich. He often described himself as having been "born on a sound wave". 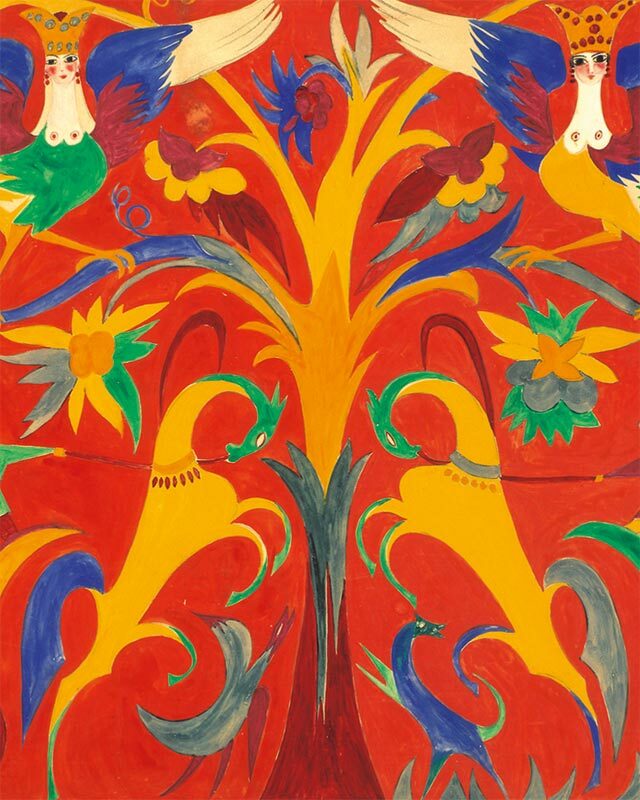 Fourthly, Goncharova was the realizer of a new art in the form of the total opera-ballet space, pioneered in her design for "Le Coq d'Or" (1914) and applied in her other work for the theatre, especially for Diaghilev's Russian Seasons. The artist's subtle, distinguished and learned designs for the theatre elucidate a fundamental shift from an emphasis on the bombastic, glory-obsessed celebrations for Diaghilev's spectacles to performances that stressed the virtues of individuality, fantasy and history. 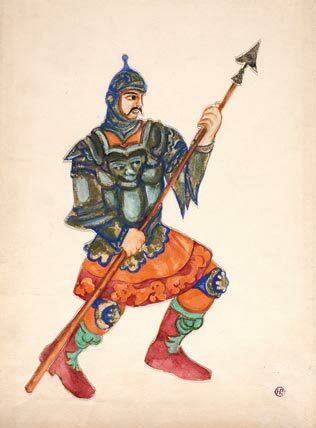 Diaghilev's absolute power within early 20th-century Russian theatre, similar to that of Louis XIV, resided in the representation and control of that representation which resided not only with Diaghilev, but also with his artists who, like the king's historiographers, created theatrical images on which the opinion of posterity depended. Theatre of the early 1900s in Russia meant ballet and opera, and ballet meant Diaghilev, who was the centre prints to which artistic pilgrims traveled. A brief article can do only scant justice to this absorbing era, and the panorama of Diaghilev's Seasons changed with the discovery of local talents among the least compatible personalities of the Russian art scene. Dazzling, selective and timely, the Diaghilev Seasons and their artists have deepened our understanding of the political and cultural complexities of Russia's artistic life. 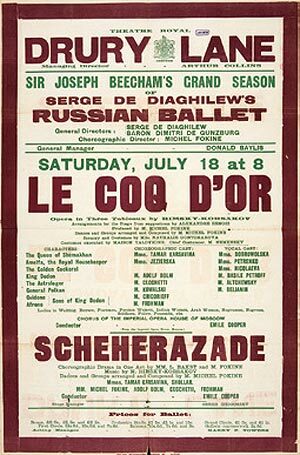 Diaghilev was in favour of divertissements for his Seasons, which drew a distinguished clientele, mainly from the aristocracy and the upper Russian and French bourgeoisie. 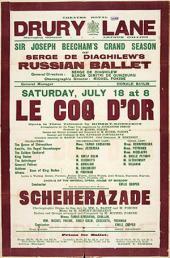 With Diaghilev's death in 1929 Goncharova lost her most important link to Parisian audiences. Like the successful production in 1929 of Prokofiev's "The Prodigal Son" by the Ballet Russes, Goncharova had lost what Paris expected of artists, and without Diaghilev, whose intuition of the French taste was impeccable, there was no one who could sharpen her with a guiding spirit. Goncharova was first introduced to Diaghilev in 1906, when he was putting together the cache of Russian art for the Salon d'Atomne exhibition in Paris. Diaghilev saw in her an imaginative, productive force that Larionov was lacking, and was quick to recognize her astonishing energy and loyalty. 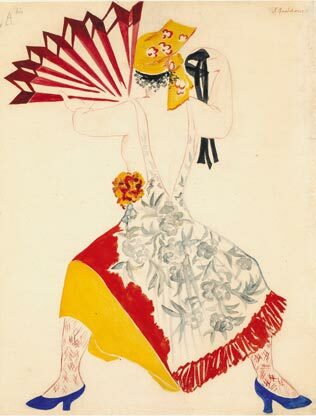 After the success of "Le Coq d'Or" she accepted Diaghilev's offer to serve as a prominent designer for his productions and moved to France in 1915. 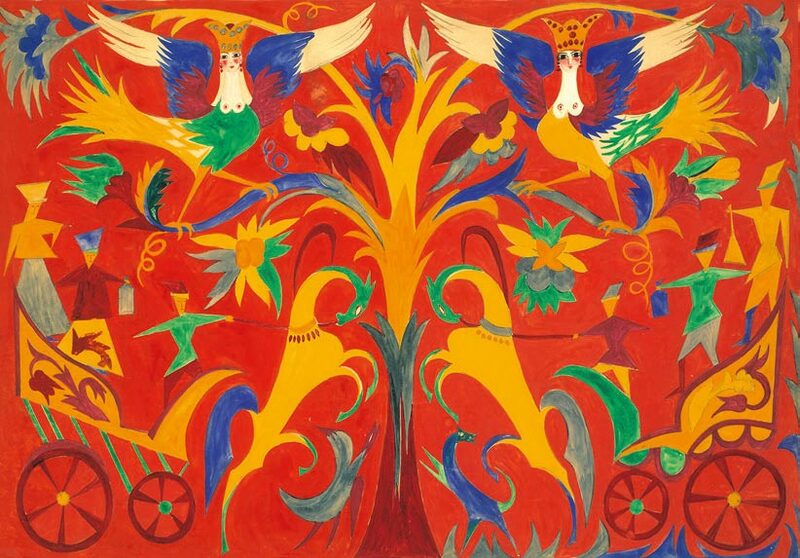 Goncharova was not directly involved with music until"Le Coq d'Or" - she was not even a music lover (until the age of 21 Diaghilev had never had anything to do with ballet, either). She was a serious painter, who had trained as a sculptor at the Moscow School of Painting, Sculpture and Architecture when she was 17: it was 1898, and the power of the "World of Art" group was absolute. She came to agree with Diaghilev that ballet rather than opera was potentially the vehicle for a fusion of the arts. Like many other artists in his service, she was regarded by Diaghilev as a technician who could be instructed by choreographers or composers, or by the magnanimous Impresario himself. But Goncharova's philosophy and artistic predilections combined to place a higher value on the music, scenery and story. Unlike Diaghilev, whose theatrical aesthetics and certainties were rooted in the principle of the Gesamtkunstwerk as promulgated by Wagner, Goncharova diligently searched for truth in the national and popular roots of every character in a production. 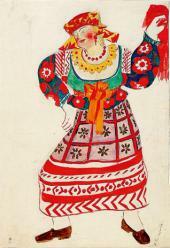 In an interview with Franck Jotterand in 1959, Goncharova confessed that while working on "Le Coq d'Or" she visited the archeological museums which inspired her to make the popular costumes; she discovered "our Tsars and his boyars", which helped to create a single melody of popular culture, an uninterrupted tradition in which she obviously later placed Igor Stravinsky, calling him a "great talent". In the course of the same interview she said: "Le people Russea un gout innipourI'art; il crie des melodies populaire qui ont fourni des themes a tous nos grands musicians, a Stravinsky par exemple; c'est un miracle que ce people, dont les conditions de vie etaient extremement dures au siecle dernier, ait eu tant de faciliti pour l'art." For Goncharova, the giants of the "painting+music=thea-tre" practice, including Igor Stravinsky, Pablo Picasso, Alexandra Exter and Alexander Golovin, should be assessed not only within the discourse on early 20th-century contributions, but also as the culmination of a conversation about ornament and design which had begun centuries earlier. Here, the shock of the new transforms into the shock of the old, or at least the surprising reverberations of the past at the heart of modern innovation. 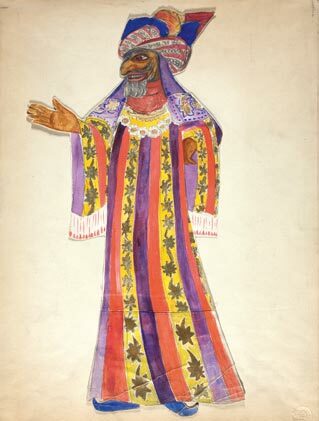 Pierre Quillard had a subtle definition of the decorative principles in theatre: "Decoration must reflect a purely ornamental idea, adding quality to illusion by placing colour and linear analogies to the play"
Goncharova's design embraced a theatrical mystique unique to herself in the early years of the Diaghilev seasons, when the taste of the public audience was contributing to a new aesthetic in art, music, literature, architecture and theatre. Unlike the opera-ballet, so well-known to us from the hedonistic Italian commedia dell'arte and the French fete galante or fete champetre , Goncharova stages a refined ethnographic recovery epitomized by the controlled aesthetics of Eastern ornament, Western high art and nostalgic rural retrospectivism. She draws us into a sensational and evocative space between reality and theatre, and finally, like all forms of theatre - whether in Russia or France - Goncharova delights us with the irresistible spirit of music and poetry. The First World War in particular made Goncharova: it provided her with a subject, which the modernist vocabulary she was cultivating was perfectly fitted to express. 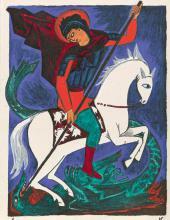 The definite change that came over Goncharova's work is evident in the series "Voina" (La Guerre), or "Images mystique de la guerre", a series of 14 lithographs on paper she made in Moscow for V.N. Kashin's publishing house in 1914. The series marked a departure from her characteristic decorative primitivism, seen here even in her lithographs. "Voina" is a disquieting and beautiful statement about history, love, life and culture under threat, that is also an extremely musical work. Although not every lithograph has a musical reference, its scintillating panorama opens with an account of the Russian allegorical figures SS. Michael, George and Alexander Nevsky, all featured in Russian music since the 18th century. Seen less from the narrow viewpoint of Russian concerns than from an international and global perspective, they highlight the decisive role, not just of Alexander Nevsky and his entourage, but also of the Russian messianic capacity in deterring the final outcome. 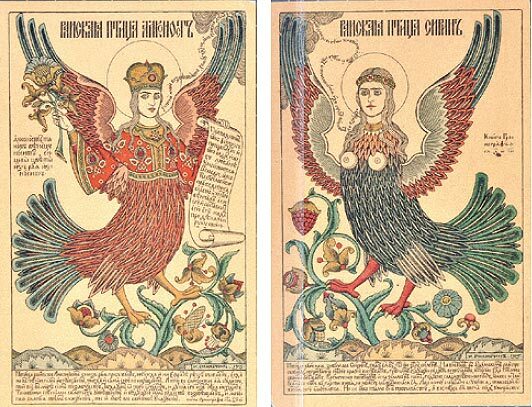 Instead of Sirin and Alkomost, the bird-maidens of paradise in medieval Russian folklore, who would come down to earth to bring their sweet songs to man, Goncharova placed the eagle and the rooster, two traditional objects in lubki. Here the Hen is an incarnation of fearlessness, proclaiming "a crystal sky and new earth free of corruption", and the Eagle is a rapid messenger of an Apoca-lypsis tolling the bells of hell. Who rung them, who heard them, and why did the Bible kept quiet about them? The lithographs ring with a spiritual anguish, the anxiety of saints burdened with the knowledge of their own mortality. Goncharova tolls the bells of heaven and hell, and on one level "Voina" can be read as the symbolically painted history of mankind torn by tensions - tensions that hold it together even while pulling it apart. On another level, the series is a melange of meditations, voices, scenes, sermons and proverbs linked by a single motif: the Life that shelters, sustains and moves us on toward our inevitable decay. But spiritual truths uttered in hell lose their lustre. The sounds of the psaltery, an instrument usually triangle or trapezoidal in form, which was used in the 15th and 16th centuries to embellish polyphonic meaning, adds to the mood of disquiet. "Voina" corresponds with her early work "Angel" (1903), which had no inscription and was later destroyed by Goncharova: there is the same high pitch of emergency that shapes the voice of the latter work. 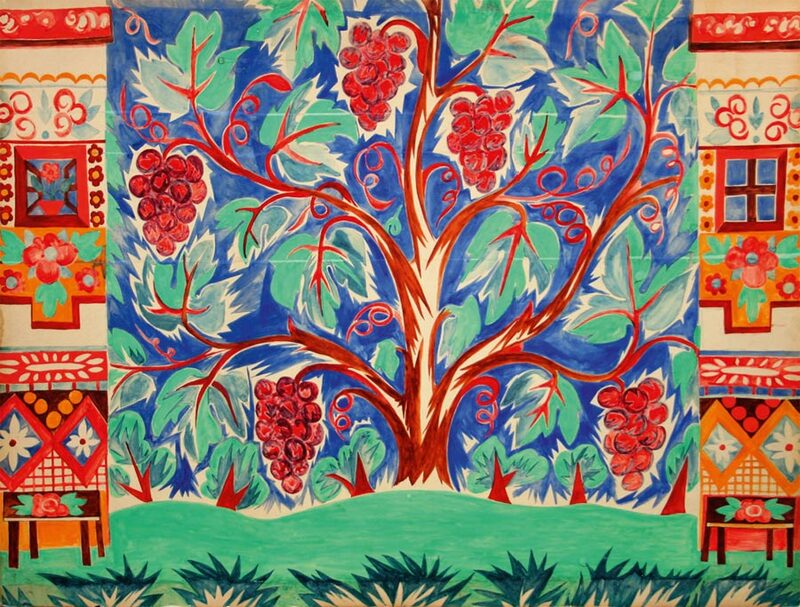 It was, perhaps, Goncharova's first painting based on icons, according to the artist herself, and there is particular emphasis on the ornamental rhythm and flat decorative treatment of spatial relationships peculiar to this Russo-Byzantine tradition. By seeing her work in such context one has a vivid illustration of the course of ideas in Russian art during this most crucial period, the decade which led to the Russian Rayonists, the French Cubists and the German Expressionists. The concept of colour as musical - providing the technical basis for linking the arts of sight and sound - stemmed from a belief in synesthesia prevalent throughout most of the 19th century. Kandinsky and Marc's publication had a high proportion of eclectic entries, departing from the standard forms and styles of illustration - a large number of these lithographs, in fact, may be considered educational work altogether. The spontaneous origin and the fragmentary shape of the book make its success seem all the more remarkable. The book presents the vision of an ideal future empire of art rather than a scientific system. One may even discover in it some utopian aspects, but Kandinsky, Marc and their companions did nothing less than outline a programme of modern aesthetics and articulate principles of artistic creativity that are still of current interest one hundred years later. The question to what extent Goncharova "approved" Kan-dinsky's plan to "link to the past" as a prerequisite for a "way to the future" and to what extent her primitivism constitutes a musical vision of modernity, parallel to those of Kandinsky, remains unanswered. Besides, her intuitive musicality echoed Rainer Maria Rilke's subject of "passionate, never ending, never finding journey-ings". Rilke has elevated spiritual isolation of a Rider to an absolute, but preserved sensitivity of his poetry to socio-political change, permeated by a sense of historical place. Rider, a spiritual traveler, accordingly, as a way of simultaneously losing and finding oneself, of discovering and disavowing place, became a premises for Rilke's art, and quite likely, for Goncharova's. She did not shy away from the term "Blaue Reiter", her spiritual predisposition, and in 1912 she contributed to the "Der Blaue Reiter" exhibition in Munich; her name appeared for the first time in the almanac in connection to David Burliuk's "The 'Savages' of Russia". Kandinsky stated: "Larion-ov offered to collaborate with the 'Blue Rider' [almanac] as late as the middle of 1913. We may assume that for the second volume he would have written on 'Rayonism', which he had just propagated in a manifesto"
By the 1910s such fusion had produced around Kandinsky's work a virtual identity between image, sound and ideology. Kan-dinsky himself took pains to reinforce this identity. How to manage musical feeling pictorially without looking like Kandinsky was a significant question for the younger painters emerging in the 1900s. One answer was not to paint landscape; another, to reconfigure it totally. All that was suggestively vague in Kandinsky's practice, all that evoked memory and reverie and thus stood apart from particular moments in time, was jettisoned systematically by Gon-charova over the course of the early 1910s. Goncharova's opposing strategy, as seen in such works as "Jeu en enfer"(1912) and "Monde a rebours" (1912) featured bold metaphorical effects of children's pribautki (humorous or facetious catchphrases), evoking bright and seemingly particular moments delivered by remarkably vigorous passages and musical notations, which allowed Alexei Kruche-nykh's poems to resolve rhythmically in Goncharova's lithographs. As has so often been noted, Goncharova seems to have taken her cue from the newly popular Russian fairy tales, proverbs and pribautki, a subject Igor Stravinsky pioneered musically two years later. It is a question of coexistence: Stravinsky's eclectic assemblage encompassing a whole tradition and Goncharova's looming cultural lightness when they both turned from the future to the past to destabilize conventional notions of what best accounted for the way "seeing" actual felt. These kinds of feelings are reappearing during our own fin de siecle, which may be one reason for our continuing fascination with Stravinsky and Goncharova. We know little about Goncharova's musical education as a child: it was not unusual for someone of her social status to receive it at home. She is believed to be one of the most musically adventurous Russian painters, who had worked with difficult personalities in Russia. The early years of her theatrical career coincided with the success of Diaghilev's Seasons. With an avid interest in theatre and the arts, Goncharova might have attended ballet and opera performances and read their popular livrets and librettos, published in the early 1900s in widely circulating editions. There are many ways to attempt to make sense of her brisk, courageous and imaginative research for "Le Coq d'Or". It clearly has many possible dimensions: literary, musical, political, sartorial, spiritual and ethnographical. Her familiarity with the vast ethnographic collection of N.D. Vinogradov, who stood behind the first exhibition of popular Russian prints at the Moscow School of Art, Sculpture and Architecture in February 1913, had certainly played a role. What Russian folkloric tradition provided, and Rim-sky-Korsakov's music demanded, was readily found in Vinogra-dov's depositary. The collection opened the door to all kinds of readings and interpretations, and that interpretation rose gradually to a point of such respectability that the cultural differences and interactions between Russian tastes and Oriental customs came to be perceived as Goncharova's aesthetic strength. In addition, her sketches for "Le Coq d'Or" provide the most compelling link between the musical and pictorial Orient. Although there are no known extant stage designs for the work, elements of the stage settings may be seen as the source of almost all the iconography of Pushkin's poem. 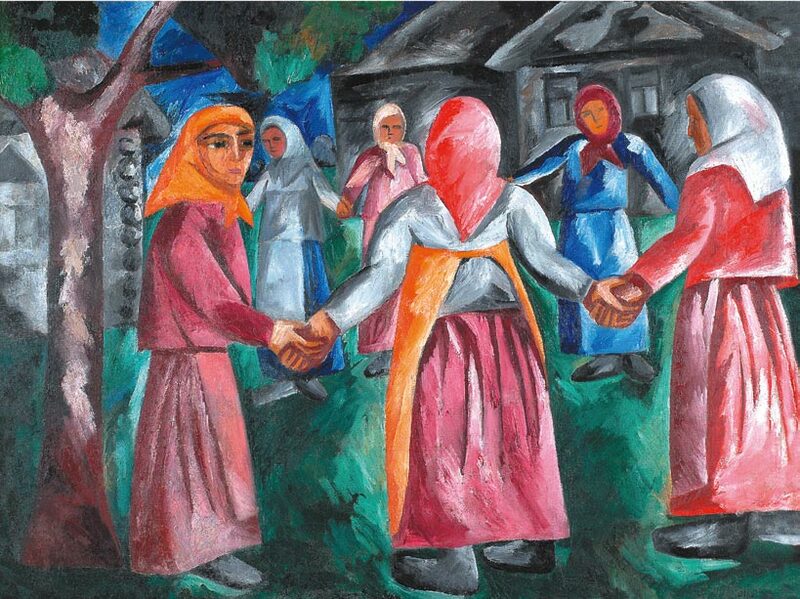 In Goncharova's painting, the fusion between East and West alludes to this. "Le Coq d'Or" praises the arts of political and cultural regeneration and the opera-turned-ballet as the modern synthesis of the arts. 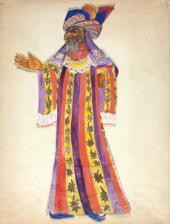 The singer costumed as Zvezdochet, personifying cosmology, is represented by the Astrologer from Washington Irving's "Tales of the Alhambra" of the Russian version. Since the Middle Ages at least, cosmological images had been associated with Europe and with a politicized ship of state. Goncharova's paintings, like the genre of the opera-ballet fusion, bring together a number of modernist elements, foremost among them a freedom from the accepted academic topoi and rules. Completed at the outbreak of World War One, and an abrupt break from the first artistic experiments and the beginning of the political collapse, Goncharova's work may be seen as an expression of resistance to politics and a welcoming to aesthetics, as well as a utopian blueprint for the transitional years between the two regimes. It is a testament to Goncharova that a century later, Russians would choose her bold and uncompromising imagery as a mark of cultural identification. Encounters with Stravinsky: "Les Noces"
Goncharova had met Stravinsky to discuss the plans for "Les Noces" shortly after the composer arrived in Lausanne in 1916. 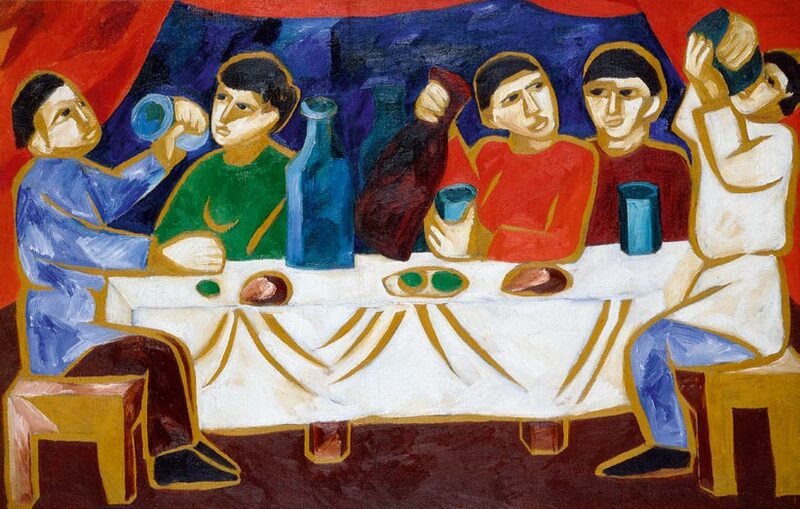 Over the next seven years Goncharova learnt that he was increasingly a person of divided aesthetic emphases. On the one hand Stravinsky was a sincerely ambitious young modernist composer; on the other, he was a devoted lover of music, faithful largely to his own compositions. Even though it is impossible to connect Gocharo-va directly to Stravinsky's musical activities and enthusiasms for innovation, it would be equally impossible to imagine that she was not affected by him, vacillating constantly between music and painting, the passion for the one perpetually infiltrating the passion for the other. This was not like the publicly discursive link between Goncharova's painting and musicality, but the personal experience of a particular artist's absorption in both media at once. 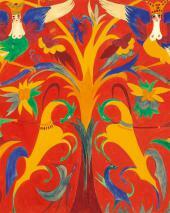 Stravinsky's inimitable achievements in the field of music were now the goal of Goncharova's design. Plot was not a strong point in Stravinsky's ballets. Such an attitude usually overlooks, however, the possibility that his music might tell stories in a different way, or tell a different kind of story - something more like a story told in pictures, for instance, or like a dream, a sequence of fugitive images, a "hieroglyphic" text that eludes the grasp of waking logic. Interestingly, in "Le Coq d'Or" and "Les Noces", the oriental, Russian, pagan styles are associated with forms of invitation, in florid invocations to Eastern wisdom and the Slavic Weltanschauung as symbolic ruler of an alternative, idealized society. In concluding this article with the Russian period of Goncharova's musical encounters we cannot assume that they ended here. New meetings and exhibitions gave her work new impetus in Paris. Music was one of the disciplines of art that inspired Goncharova to profound insight. The many stimuli that bring such variety and richness to her work - taken not only from music but also from nature, philosophy and peasant culture - are so well assimilated that questions on the origins of the separate motifs are totally irrelevant. Goncharova's intuitive understanding of rhythm, musical dynamics and harmonics grew not only from contact with these and other sources, but above all from her own appreciation of music. Curtain design for “Les Noces” (The Wedding ) Ballet by Igor Stravin sky Never staged Paper on carton, gouache, graphite pencil. 53 × 73.5 cm. Tretyakov Gallery. 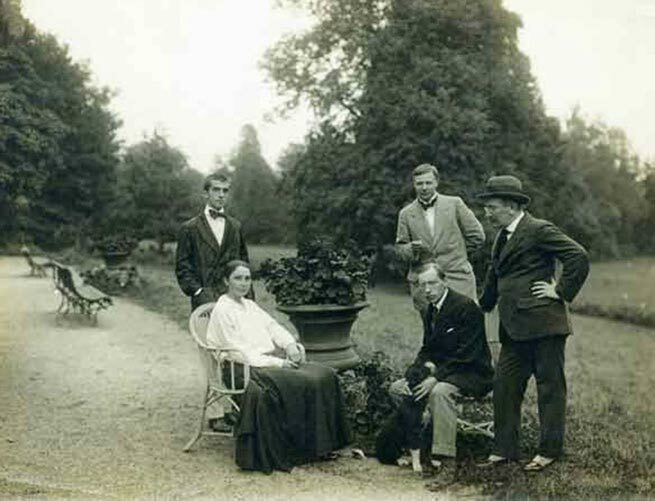 Natalia Goncharova and Igor Stravinsky (sitting ), Léonide Massine, Mikhail Larionov, Leon Bakst. Ouchy, Switzerland. 1915.